After experimenting with different EEG amplifiers, I got more information about different EEG electrode position. And then my summary ought to be revised. Below are the revisions in my PhD note. In my notes, I add information about CSP spatial filter because this filter is suitable with EEG amplifiers with more than 8 electrodes. CSP is Common Spatial Filter. This filter is used for motor imagery BCI involving lateralization of hand movement: left versus right, contralateral versus ipsilateral. The EEG amplifiers, I have used so far in my PhD study at the University of Oldenburg, as well as in my master study at the University of Bremen, are below. mBrainTrain Smarting, a mobile EEG amplifier with 24 electrodes, since the second year of my PhD study. gtec MOBIlab+, a mobile EEG amplifier with maximum 8 bipolar electrodes, for the third semester of my PhD Study. Easymotiv, which is modified Emotiv EPOC with Easy Cap, a mobile EEG amplifier with 14 electrodes, for the first semester of my PhD study. TMSi Porti 7, an EEG amplifier with 32 electrodes, for my master thesis. gtec USBamp, an EEG amplifier with 16 electrodes, for my master project. Tulisan ini adalah revisi dari rangkuman posisi elektroda EEG untuk Brain-Computer Interface sebelumnya. Revisi dilakukan setelah mencoba beberapa EEG amplifier. Dalam revisi terdapat penambahan informasi tentang Common Spatial Pattern (CSP) sesuai catatan doktoral 24 November 2014. Putting the Emotiv EPOC headset. Calibration with ball and box from the laptop. From the video, I can see that BCI2000 is used to connect the Emotiv EPOC system and the bionic arm system. One student said that the price is less than 10 millions rupiahs. This means that Emotiv EPOC Research SDK (with a price of 750$) is used. Since August 2014, research SDK is not sold anymore and there is new Emotiv EPOC Education with a price of 1799$, now. It is unknown if the dll files still compatible with BCI2000 or not. Well, I had problem connecting Emotiv EPOC Education with OpenVibe. The classifier are not explained nor seen from the video. It would be too complicated for “non-scientific” news channels. The calibration takes about 1 minute, on the video. The calibration method is using a ball and a box. On the monitor, there is a ball and a box. The ball should be moved closer to the box, using imagination of motoric movement. In calibration, both the machine (as classifier) and the human (as user) will learn to perform the motor imagery task. Well, 1 minute is fast. It is unknown whether the user had trained backstage before performing on camera. Haha! For real-time usage of BCI, single-trial motor imagery has to be used. In calibration, more-trial motor imagery has to used for calculating the parameters of the classifier. From the video, we can see that the bionic arm moves only when the user do mental task of motor imagery. So I think the classifier is good and the user is “BCI-literate”. When the user clapped her hand, the bionic arms didn’t move. So I think the classifier detects hand grasping or finger movement and neglects other hand movement. In my opinion, the user has trained backstage before she is on camera. She has known that she has to imagine grasping movement. The classifier parameters may have been saved before the show. That’s why she is doing calibration fast and she can easily move the bionic arm (without instruction from the experimenters). From the video, there are 3 students (Electrical Engineering from ITB, Bandung, Indonesia). I think they have to separate tasks to do the projects. One should manage software and hardware to drive bionic arm. One should manage Emotiv EPOC connection with BCI2000. One should connect all the system to make sure that everything works. Also, one should design what kinds of classifier that works: linear discriminant analysis (LDA), common spatial pattern (CSP), or simple thresholding of ERP (event-related potential) or others. I think they use C++. From my experience with BCI2000, Microsoft Visual C++ has to be used. I haven’t tried the new BCI2000. Maybe it works with C++ in many other environments: Eclipse and Linux. Well, I should go back to my real research, instead of blogging. After reading the theses from my research mates from Uni Oldenburg, as well as Uni Bremen, I summarized some EEG electrode placements in my PhD note. So these are the links to my note. SSVEP stands for steady-state visually evoked potential. The idea is to minimize the number of EEG electrodes, which I am planning to use with my mobile EEG device. Putting electrodes to the scalp takes a lot of time. If 192 electrodes were put on whole scalp, it could took 1 hour or more and it would not be practical for the users. Also, analyzing the data from a large number of electrodes has a curse of dimensionality. I am planning to record using 8 or 16 or 24 EEG electrodes. Less is more! 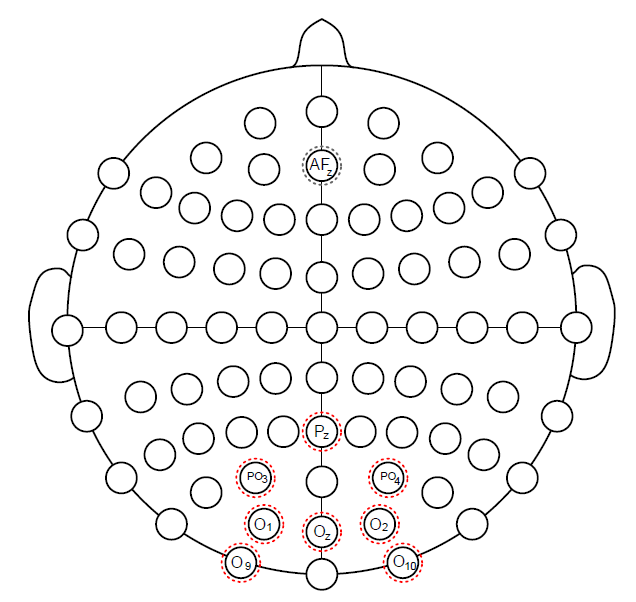 The EEG electrode placement which I need have been noted, so I just look into those specific electrode positions for my analysis, as well as, online signal processing. Tulisan ini adalah rangkuman dari posisi elektroda EEG untuk Brain-Computer Interface (BCI) berbasis SSVEP, P300, dan “motor imagery” atau gelombang mu, untuk bulan ini. Last week, I am trying to find out what CMS and DRL in my Emotiv EPOC are. 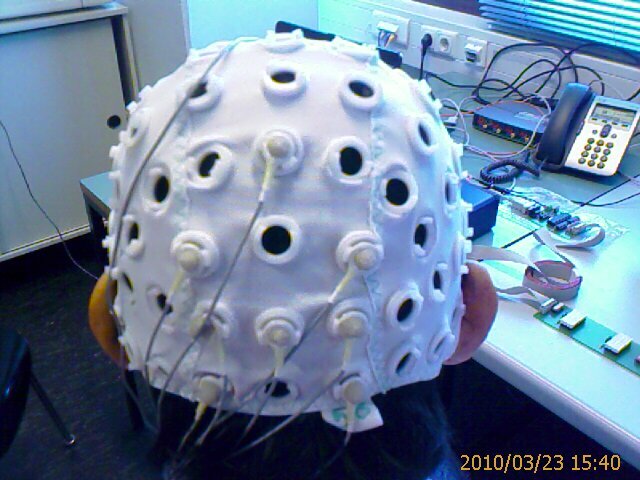 For my experiment(s), those electrodes are used reference (REF) and ground (GND) on EEG cap. From the documents, which are found or given, CMS is used as REF and DRL is used as GND. It is unknown whether that configuration is compulsory or optional. From Biosemi website, I got good explanation about CMS and DRL. They form a feedback loop for references for Analog-to-Digital Converter (ADC) of other electrodes. The schematic of CMS and DRL from Biosemi is shown below. In my electrical engineering view, as passive electrode, DRL is suitable for ground. CMS, as active electrode, can be treated as reference on the head. Both will perform looping to get references in ADC for other electrodes. The idea is understandable for me. Well, I am still hoping that my research is going in the right direction. How seriously is Indonesia doing research on Brain-Computer Interface? My previous blog post is about Brain-Computer Interface (BCI) research in Bandung, Indonesia (1,2,3). The research is conducted in School of Electrical Engineering and Informatics (STEI) at Institut Teknologi Bandung (ITB). I know some people who has taken part in this Bandung BCI research. However, I wonder what and how are the research outcomes. Below is the figure of literature study of EEG-based BCI between 2007 and 2011 from Hwang, et al in 2013. The paper is “EEG-Based Brain-Computer Interfaces: A Thorough Literature Survey” in International Journal of Human-Computer Interaction, 29: 814-826 (doi), from Taylor & Francis. The authors are Han-Jeong Hwang, Soobeom Choi and Chang-Hwam Im from Hanyang University in Seoul, Korea, and Soyoung Kim from University of Rochester, New York, USA. 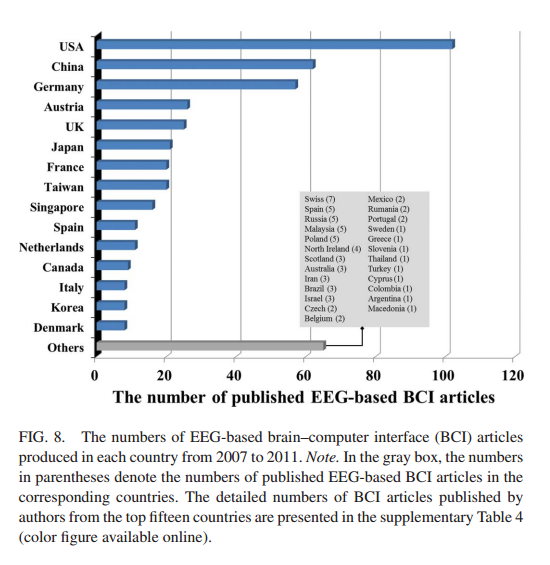 The figure above shows the nationalities of the authors of EEG-based BCI articles between 2007 and 2011. The articles have to be indexed by Web of Science, a database provided by Institute for Scientific Information (ISI, Thompson Scientific, Philadelphia, USA). Conference abstracts and editorials are not included. So the articles are research paper, review paper, feature, brief communication, case report, technical note and chronology. As we can see from the figure, there are no Indonesian. So Bandung BCI group have never published their research in journals, indexed by ISI. As far as I know, the Bandung BCI group also had a collaboration with the Faculty of Medicine of Universitas Indonesia in Salemba, Jakarta, Indonesia. From some conference papers I have read, Institut Teknologi Telkom (IT Telkom) in Bandung are also doing research on EEG signals processing. But universities and also research institutes in Indonesia have not published scientific articles about EEG-based BCI in reputable journals between 2007 and 2011. Well, I am Indonesian, currently doing research on EEG-based BCI. I just began my PhD program this September 2013 at Carl von Ossietzky Universität Oldenburg in Germany. So I have not yet published any journal papers. I hope, as an Indonesian, I play important role in international research on Brain-Computer Interface (BCI). In the next literature review, I hope there will be at least one Indonesian and that shall be me. The pictures are about EEG electrode placement for SSVEP-BCI, according to 10-20 system (wiki: en,de). EEG is electroencephalography, which is recording of electrical signals from scalp (wiki: en,de,id). SSVEP is steady-state visually evoked potential, which is EEG signal as a response of flickering stimuli with certain frequency (wiki: en). BCI is Brain-Computer Interface (wiki: en,de). The electrode position for SSVEP BCI is Pz, PO3, PO4, O1, Oz, O2, O9 and O10. The ground is AFz and the reference is one ear lobe, either left or right. This position is used on my master thesis (book,slide). P.S. Now, I am thinking about EEG electrode position, for BCI, based on motor imagery.